Record low levels of ice have changed how the Bering Sea looks throughout the year. Now, scientists want to know if that will also change how the sea sounds. Since 2013, Antunes has been dropping them over the side of fishing boats in the Bering Strait and off St. Lawrence Island. 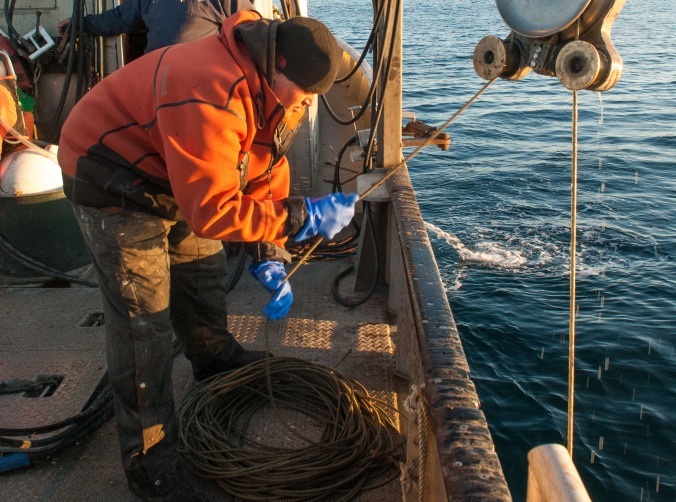 He’s trying to do something that’s never been done here: listen in on the Bering Sea. The recorders pick up everything in the water, from whales and walrus, to passing ships. “We wanted to monitor the current levels, what we call the baseline levels: how are things at the moment? So that we can compare 10 years, 20 years from now,” Antunes said. That’s because the Bering Sea is changing. Fast. Rising temperatures have meant less sea ice year after year. And with more open water, shipping traffic has increased. Both trends are expected to continue. Antunes is a conservation scientist at the Wildlife Conservation Society, based in New York. He says for years, Alaska Natives, particularly from St. Lawrence Island, have raised concerns that increased shipping could drive away the marine mammals they depend on for food throughout the year. “Marine mammals are very sensitive to noise, and all this additional shipping in these waters might create an impact by the introduction of noise,” Antunes said. Scientists have used satellite tags and aerial surveys to track mammals in the Bering Sea, but Antunes says a study like this one is something new. One advantage of a sound-focused, or acoustic, study is that the instruments can be left in the water for months at a time. “Our instruments monitor for long periods, times when everything’s covered in ice, in bad weather, good weather, in conditions when it’s hard to get out there and monitor,” Antunes says. That gives scientists a record of the animals—and ships—in the water over an entire season, not just at a point in time. The project started small. 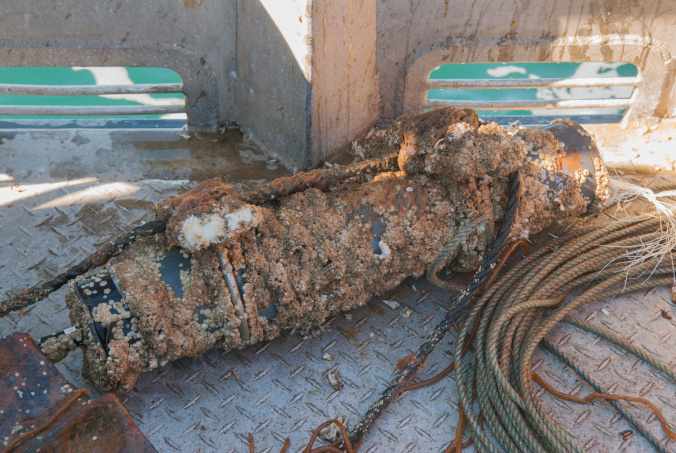 With the help of local hunters, Antunes and his team put in place a single recorder off the coast of Gambell in 2013. It recorded sound in the water for 30 days. Gradually, as they’ve gained more funding, they’ve been able to add recorders and expand the study farther north into the Bering Strait. After Antunes retrieves the devices, he can listen to what’s been recorded and hear the movement of marine mammals. He says once you learn each animal’s distinctive calls, it’s not hard to pick them out, from the rubbery song of bowhead whales to walrus’ tell-tale knocks. What the sounds show right now—the baseline Antunes talked about—is not surprising: ships pass through in the summer, and marine mammals are most common in the winter, when sea ice locks up the Bering Strait and St. Lawrence Island. Seals and walrus use that ice to haul out, and hunters use it to harvest them. Or, at least, that’s how it used to go. In the past, the Bering Sea would begin to freeze around St. Lawrence Island as early as October. But this year, there’s still open water in March. That might be an understatement. Delbert Pungowiyi is president of the Savoonga IRA. Born in 1959, he says he grew up with nine months of winter. “Every day, those of us that grew up with the ice, when we look out toward the ocean, when I look out towards the ocean now today, I’m in a state of shock, disbelief,” Pungowiyi said. Antunes says it isn’t yet clear how the lack of ice will impact marine mammals. Ice-free waters for more of the year could mean more shipping traffic when the mammals are present, potentially disturbing them. But then again, without the ice, Antunes says the animals might not come down to St. Lawrence Island at all. That is what Pungowiyi is worried about. Marine mammals mean food security. Without them, his community will have to find new ways to sustain itself. Antunes plans to share his findings and recordings with the communities where he worked. If he can get the funding, he’ll continue the study. He hopes to work more with local hunters. Until then, he’ll be back in New York, listening closely, while Pungowiyi continues to watch the sea.